Fine, vintage, and costume jewelry curated in Cincinnati, OH. 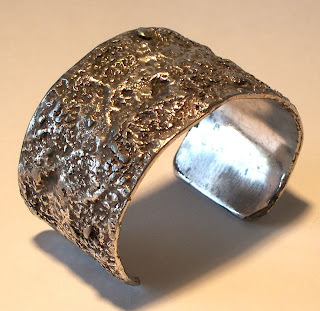 Home / Blog / Modernist Denmark Molten Silver Cuff Bracelet — Jacob Hull? Modernist Denmark Molten Silver Cuff Bracelet — Jacob Hull? I obtained this bangle recently. It’s a little different from things I’ve had in the past. The bangle is made from a heavy base metal with a silver plated finish on top. It has a modern design with a molten looking texture on the front. The maker’s mark is “DS Handmade Denmark”. Another well-respected site shows a simliar piece of vintage jewelry with the same mark and attributes it to Jacob Hull. Hull was active in the 1960s-1970s and was know for using silver plating. If anyone can help me with further info, I’d much appreciate it! What is a Japanned Jewelry Finish? hello.I m a jewelry model maker . I do hand made jewelry by silver and gold. we have some problems in our country that this problems fix me in bad situation.I can send my informations and my work s picture for you. and I want to know: can you help me in this case?? do you need a person who make the jewelry by hand??? Please let me know if you are still looking for information on this piece. Jacob Hull was fanatical about marking his work. As this is marked with a DS, my first inclination is that it is not a Jacob Hull. Although he did use silver, and gold plating, in particular for the designs created for B&D, those were always marked B&D, as well as either JHULL, or HULL. With the exception of the pieces for B&D, Hull worked alone, and was exceptionally diligent about protecting his work. There are a number of websites which discuss Jacob Hull, his work, and practices. 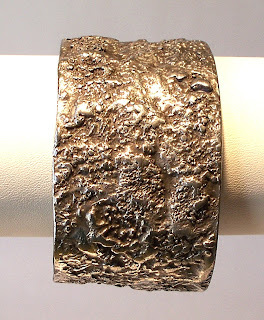 AJ on Modernist Denmark Molten Silver Cuff Bracelet — Jacob Hull?